The French-English artist paints daily life and women in India. As she travelled the country on many occasions, she became passionate about this culture that she knows and understands very well. 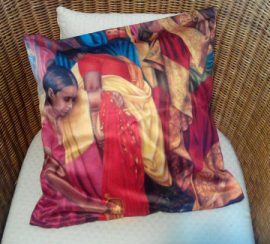 For the opening, mugs and pillow cases with paintings imprinted on them, will be sold. The funds raised during the event will be given to the association in their entirety.